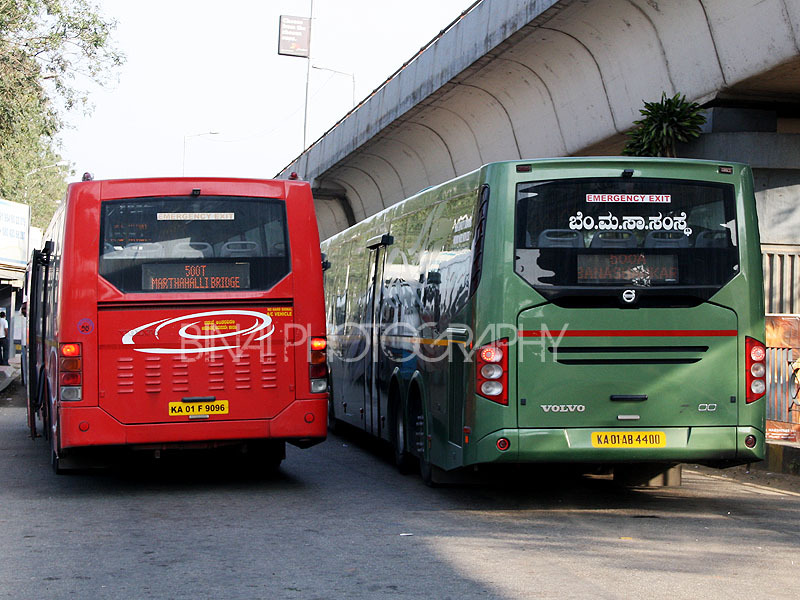 Volvo introduced its City buses in India way back in 2006. 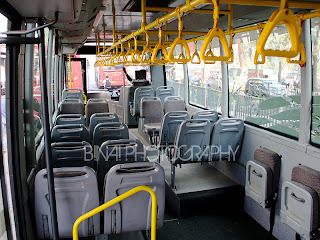 Ever since, Volvo has changed the way people travel in many cities across India. The revolution launched in Bangalore, soon spread to various other cities like Chennai, Mysore, Navi Mumbai, Kolkata, to name a few. 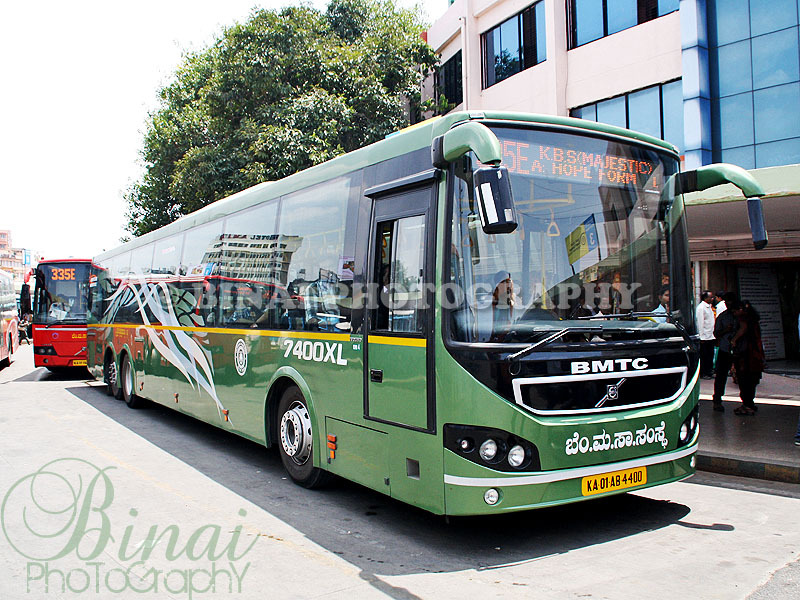 Volvo made a revolution in the way Bangaloreans travel - the local transport provider, BMTC, kept adding more buses to its fleet every year, and has now reached an amazing figure of about 566 Volvo buses doing the run in the city - that is almost the city bus fleet size of an average Indian City! 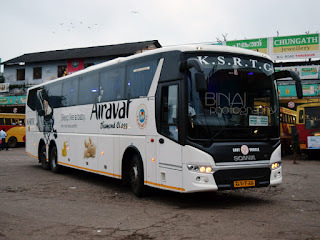 Sometime in December 2011, Volvo came out with its new products for India. One product caught my attention the most - the Volvo 7400XL City bus. This was a 14.5M long bus, with steerable axle. A 14.5 metre city bus? The longest bus currently on Indian roads are the Articulated buses (about 16M Length) - these buses struggle a lot on city roads. 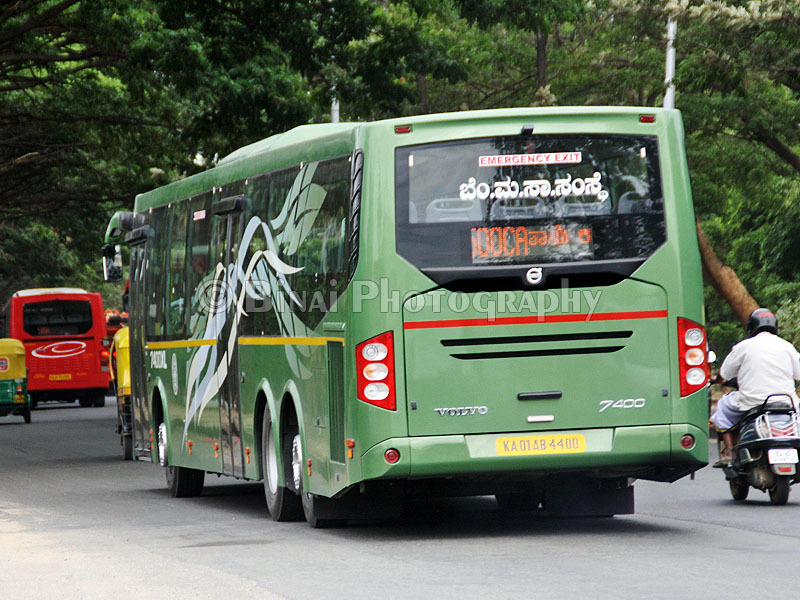 Even the 12M long buses struggle a lot on city roads - even in cities like Bangalore. I was skeptical about a 14.5 M long bus. 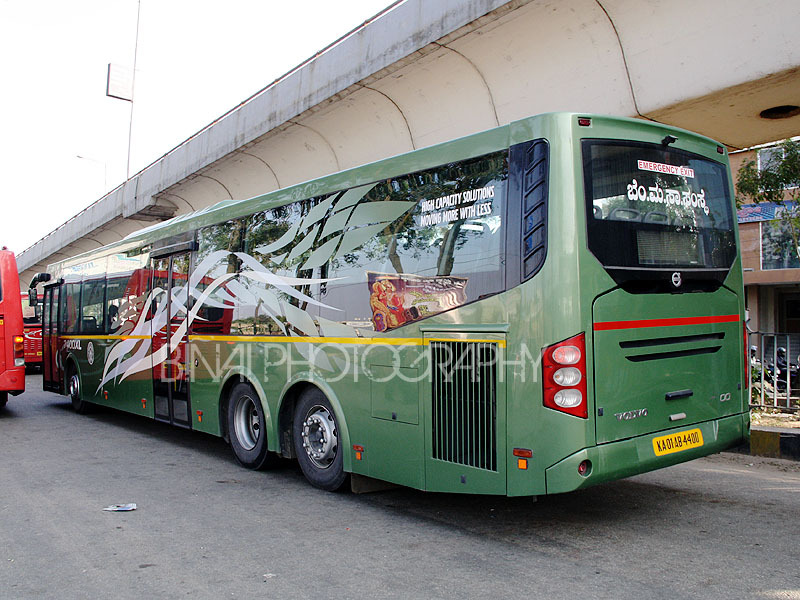 The bus was launched at the AutoExpo held in New Delhi. 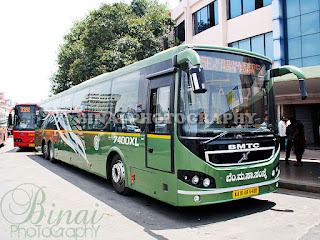 Come June 2012 - news papers announce the launch of the Volvo 7400XL trials in Bangalore. Now that was something a lot of us in the bus enthusiasts circle were waiting for. The bus hit the roads, and BMTC operated it on all the Volvo routes in the city - they ran on crowded roads like the Bannerghatta Road, or on less crowded (relative term) roads like the Outer Ring Road. 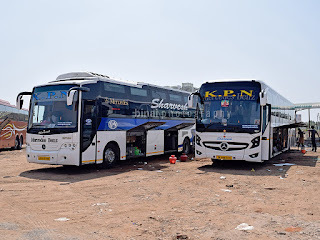 Some drivers mumbled and fumbled with the bus, while some others swore this bus was as comfortable to drive as the other Volvo city buses. 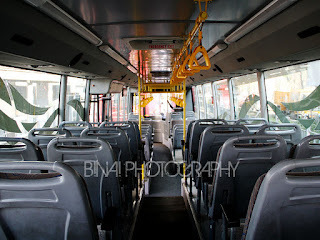 My busy schedule and awkward timings kept me away from the bus for a long time. In October 2012, I saw the bus back at the Volvo Factory - I thought my chance of trying it was over. 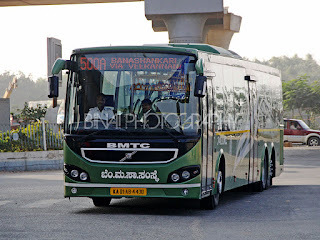 In December 2012, I had a forced season of bus journeys - I used BMTC Volvo services extensively to commute to office, and was a fan of the "Gold Day Pass" - although priced at Rs. 100, it was completely value-for-money for me. Sometime this month, I saw the Volvo 7400XL sneaking through the outer ring road one evening - so was the bus back? 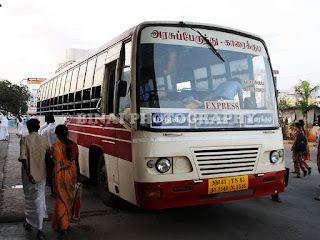 I kept monitoring this bus on most days and understood that it was running a particular schedule daily. But the bus' timings were completely opposite to mine - I decided to try out during a weekend. Spotted in September 2012 - at Majestic. December 17, 2012, around 1545hrs. Tired and exhausted from a long walk to the bus stop, I dump myself inside a fairly crowded Volvo heading to Silk Board on 500-D from Hebbal. As I sat down, I saw a familiar green coloured bus standing on the other side of the road - that was the Volvo 7400XL. I immediately rushed out of the bus that I was sitting in, and decided to wait for the XL to come around. The XL came around to the passenger area some 10 minutes later. Coming in to pick me.. I was all excited, and I went on a clicking spree. 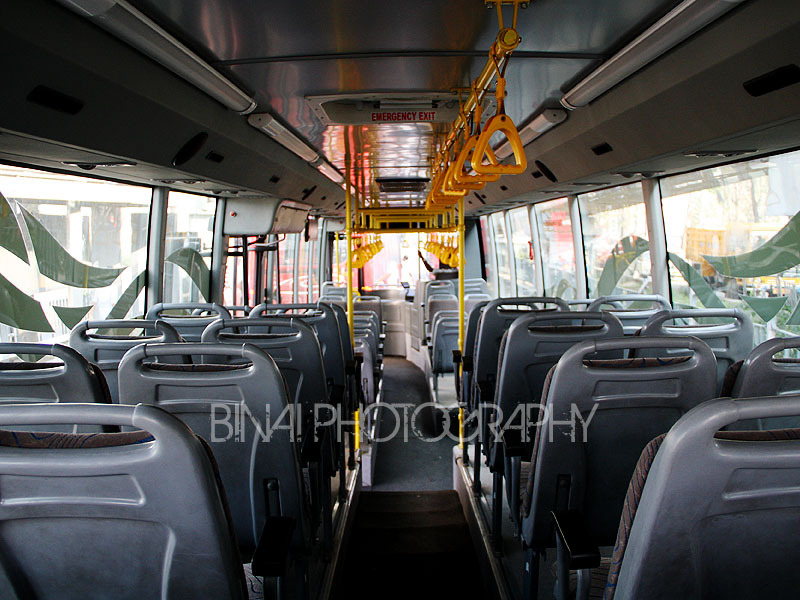 After clicking, I got into the bus. 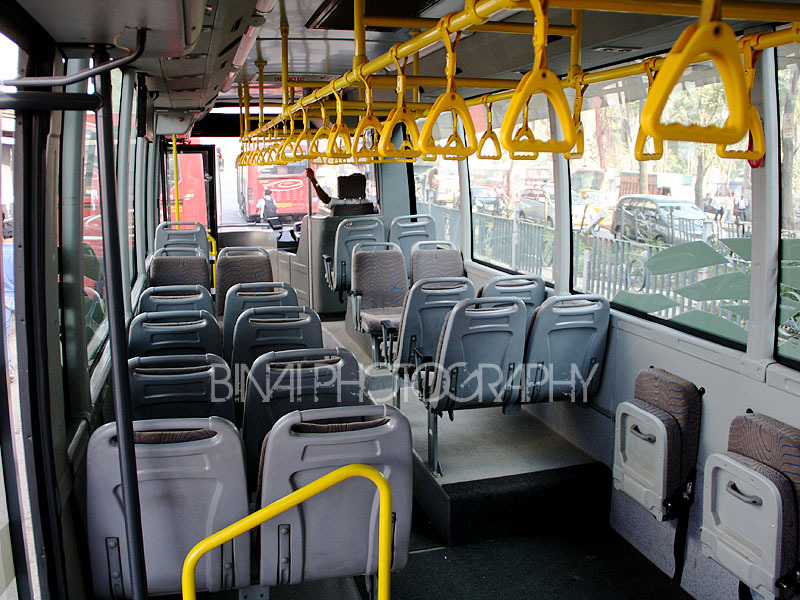 The crew wanted to know why I took the photos - when I told them that i was clicking since it was a new bus, the crew were all smiles and they were excited to say about the features of the bus. I headed straight to the rear - to my favorite seat. 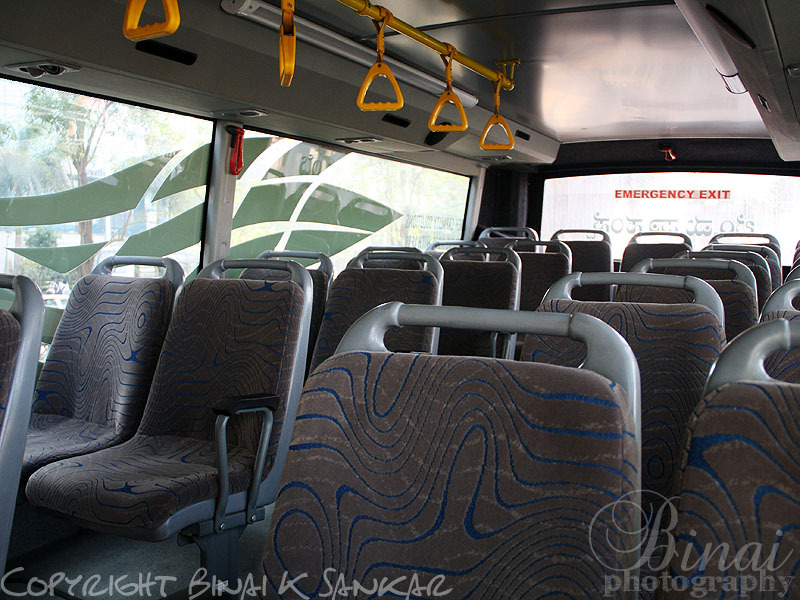 After some photos, I thought I should seat towards the front of the bus - to see the difference in ride quality. I had a pass, so did not have to get a ticket. The design on the glasses. The stickering was opaque. The bus rode very smooth. 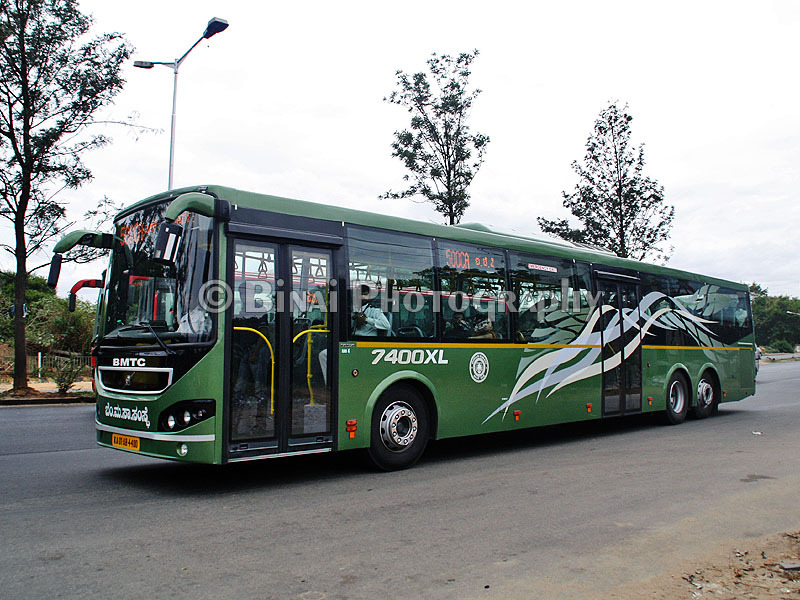 The engine sounded a bit strained - it is the same D7E, 290hp 7-litre engine that does the duty in this bus as well. It struggled to get moving from some places, but it was handling well after that. The rear steerable axle was helping the bus make tight turns - there weren't much turns in the route though. 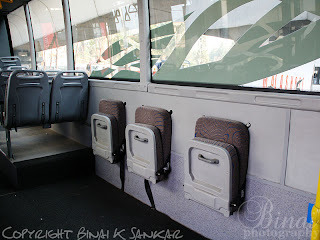 The seating was amazing - the leg space was better than the normal 8400s. The engine sound had better damping than the 8400s - but then I was seated really far from the engine. The AC was doing a good job in keeping the 14.5 metre bus cool. As the ride progressed, the bus filled up. The extra length meant more people could sit in the bus. The bus has 51 seats. The bus reportedly can carry 100 passengers including standees - that is a big number for a city bus. 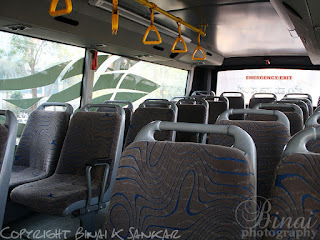 The entire interiors were carpeted - giving it a very plush feel. This helped in dampening the sound as well. I loved the ride. After this experience, I took back my word about its feasibility in city - the bus is an excellent candidate for operating on city routes. It cannot be sent on extremely narrow roads - but it can do well in good roads. 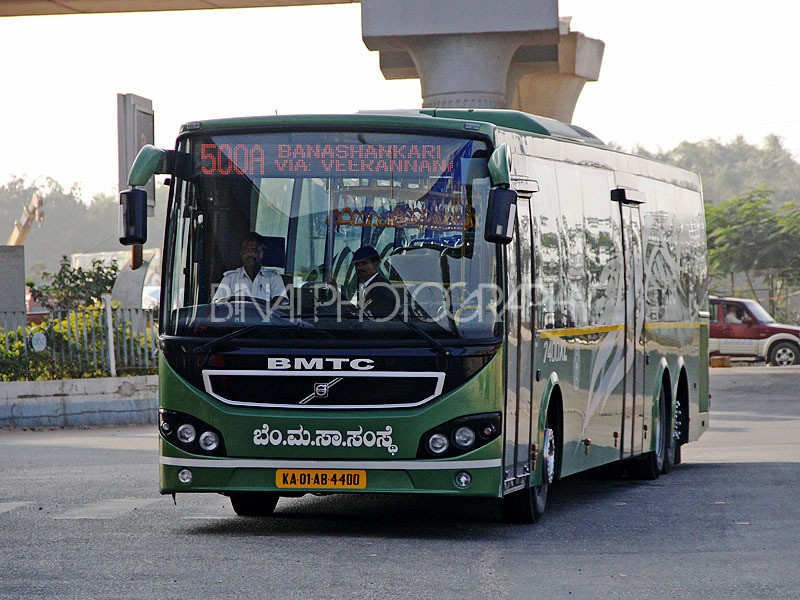 I hope BMTC goes for these buses - they can do a really good job on the high-density routes, like ITPL, Electronic City, Outer Ring Road, etc. The ability to carry 100 passengers is a plus for these routes. 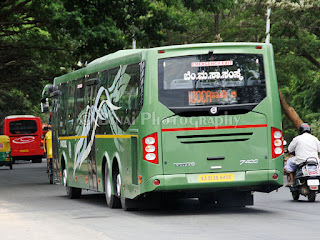 I hope to see more of these monsters on Bangalore roads.. I saw this bus taking a U-Turn under the Silk Board flyover which is narrow in one go easily when it was doing 500 D route .